Kinder and 1st grade sight word assessment. The flash cards are color coded to support the Sight Word Assessment Sheet. They are great resource to help students practice their sight words at school and at home. 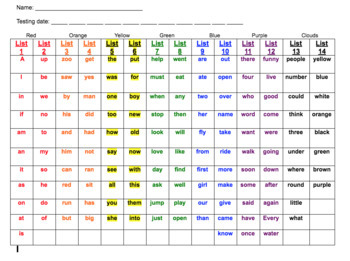 The fluency pages support the Sight Word Assessment Sheet and are easy to print and place in a child's homework folder or include in a literacy workstation. An all in one page to print for student folders or to use at a literacy workstation. This document supports the Sight Word Assessment Sheet. The bundle includes the assessment sheet, flashcards, fluency pages, student sight word list, and a black and white copy. In addition to these resources, each student has a rainbow in their data folder and they color in as they master each list.